Since 2012, Mark Goldin is a board certified physician and an attending in the Division of Hospital Medicine, Zucker School of Medicine. During that time, he has held several administrative roles. He is a member of the system Coalition of Leadership on Thrombosis and founded a local chapter at Long Island Jewish Medical Center. He also serves as team lead for the system Anticoagulation Collaborative. 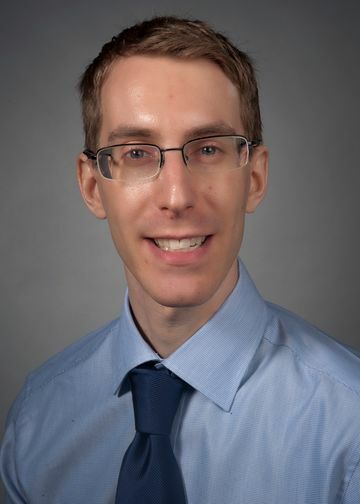 In medical education, Dr. Goldin has served as Director of the Zucker School of Medicine medical student clerkship in Medicine, a member of the North Shore-LIJ Residency Interview Committee, and a member of the Zucker School of Medicine Faculty Council. At the national level, Dr. Goldin has served on the Society of Hospital Medicine (SHM) Performance Measurement and Reporting Committee and the IT Quality Sub-Committee. He has presented abstracts and podium talks nationally at SHM. Dr. Goldin’s research has focused on venous thromboembolism (VTE), perioperative care, and hospitalist-surgeon co-management. He has collaborated with the Department of Orthopaedics to study the use of aspirin for VTE prophylaxis after hip and knee arthroplasty. He is also a sub-investigator and head of recruitment at North Shore University Hosptial and Long Island Jewish Medical Center for the MARINER study, a global trial of extended post-discharge VTE prophylaxis in high-risk patients. Current work with the Division of Geriatrics and Palliative Care and the Department of Orthopaedics focuses on implementing a model of geriatric/orthopaedic co-management for patients admitted with hip fracture. Mullan CW, Tariq U, Goldin M. “Fragmented central venous catheter retained for years with minimal symptoms.” Clin Case Rep. 2017 Jun 15. doi:10.1002/ccr3.1041. Yang S, Goldin M. “Fluids, diuretics, vaptans, and more: therapeutic advances in hyponatremia.” Am J Ther. 2017. (Accepted for publication). Goldin M, Hughes GJ, Choudhary Z, Tariq S, Shafeeq H, Cohen J. “Anticoagulants: new advances in reversal strategies.” Am J Ther. 2017. (Accepted for publication). Shah SS, Satin A, Mullen J, Merwin S, Goldin M, Sgaglione N. “Impact of recent guideline changes on aspirin prescribing after knee arthroplasty.” J Orthop Surg Res. 2016 Oct 20;11(1):123. Goldin M, Hahn Z. “A hiccup in holiday plans.” BMJ Case Rep. 2016. doi:10.1136/bcr-2015-213288. Goldin M, Li J, Amirrezvani A, Riker D. “A case of pseudomyxoma peritonei (PMP) associated with a primary giant cell adenocarcinoma of the lung.” J Bronchol Intervent Pulmonol. 2012 Jan;19(1):50-3. Goldin M, Ji L. “Uvula necrosis, an atypical presentation of a sore throat.” J Emerg Med. 2013 Jan;44(1):185-6. doi: 10.1016/j.jemermed.2011.09.001. Epub 2012 Apr 9. Zuo T, Shi X, Liu Z, Guo L, Zhao Q, Guan T, Pan X, Jia N, Cao W, Zhou B, Goldin M, Zhang L. “Comprehensive analysis of pathogen-specific polyclonal antibody response in vivo based on a combinatorial antigen library displayed on the surface of yeast Saccharomyces cerevisiae.” J Biol Chem. 2011 Jul 27. Shang H, Han X, Shi X, Zuo T, Goldin M, Chen D, Han B, Sun W, Wu H, Wang X, Zhang L. “Genetic and neutralization sensitivity of diverse HIV-1 env clones from chronically infected patients in China.” J Biol Chem. 2011 Apr 22;286(16):14531-41. Epub 2011 Feb 16. Han X, Dai D, Zhao B, Liu J, Ding H, Zhang M, Hu Q, Lu C, Goldin M, Takebe Y, Zhang L, Shang H. “Genetic and epidemiologic characterization of HIV-1 infection In Liaoning Province, China.” J Acquir Immune Defic Syndr. 2010 Feb;53 Suppl 1:S27-33.